Today I all of a sudden found myself investigating the creation op PL/SQL based Data Services, returning XML documents with data from SQL queries to HTTP Clients. The direct motivation behind this investigation was my initial introduction to Oracle BI EE, the use of HTTP Data Sources and my brainstorming on SOA in general and ESB Services in particular. Although the BI EE can directly access Oracle databases, executing its own SQL queries, it feels much better architecturally speaking to have separate, decoupled services query the data and publishing them as service, for example through Http. 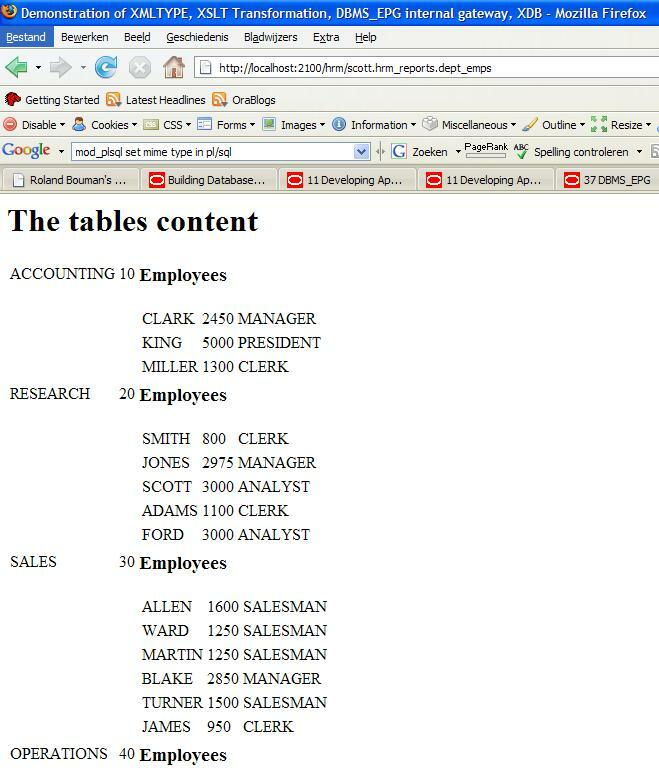 In this article I will create such a data service, with minimal effort: leveraging SQL XML and DBMS_EPG, the Oracle 10gR2 embedded PL/SQL Gateway, part of XML DB. 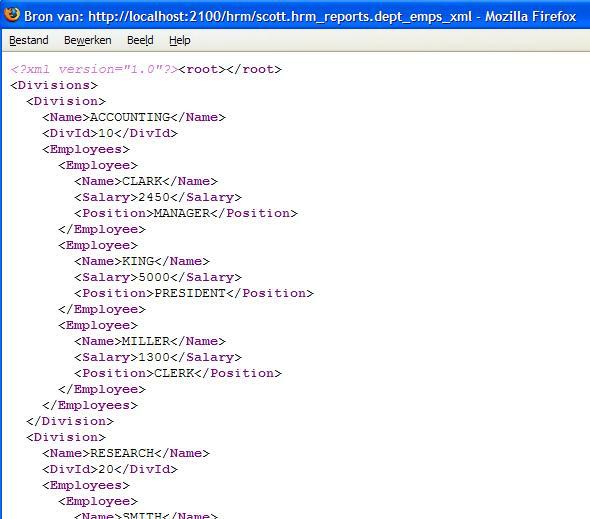 The first step is the creation of the actual XML document we want to base the data service on. We will be using Oracle XDB features – XMLType, SQLXML (XMLElement, XMLAgg, XMLForest) and later on Transformation – to get exactly what we want. What we need now is a way to take our XML to the world. 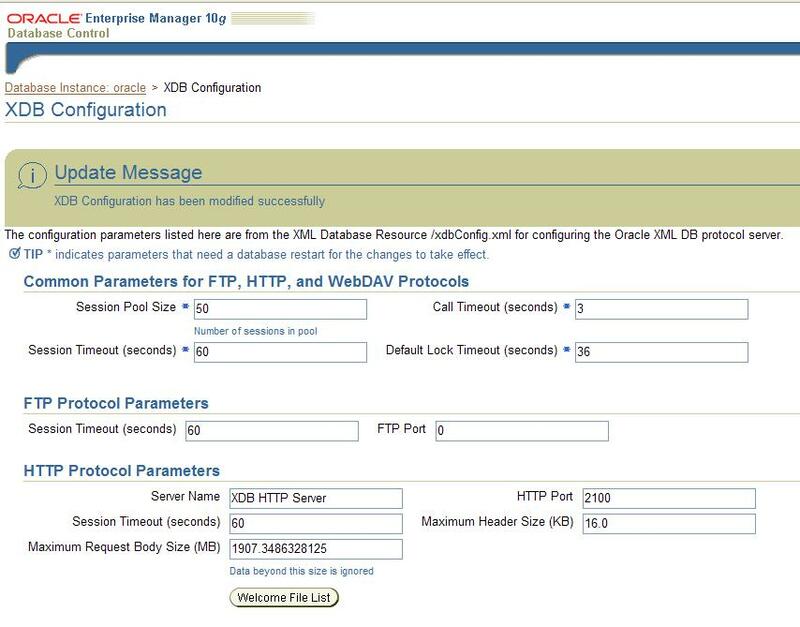 Initially the XDB configuration has the FTP and HTTP port disabled (set to 0). To activate a real port, I use the Enterprise Manager Database Control to modify the XDB configuration. Here I have set the HTTP port to 2100. That means that my calls to the EPG will be directed at that port on the host running the database. At this point I should be able to access my package through the following url: http://localhost:2100/hrm/scott.hrm_reports.dept_emps. BTW I guess that the spam protection doesn’t really like my Firefox (I have to login to comment, or I am very bad in counting). Very nice post. One remark, one question though. Remark, do not create items under the XDB account if you don’t really need to. The XDB schema is / and will be some kind of SYS schema. This means (currently) that in the case of an upgrade of the database or rebuild of the XDB schema/(XMLDB)functionality your procedure will be gone. Question: why transform XML to XML?